Since I’m inescapably drawn to writing picture books when I'm not working on my middle grade novels, I decided I’d better start reading more of them and figuring out what makes them work. So every other Friday, I'll post "Learning from Picture Books" to share what I'm learning. 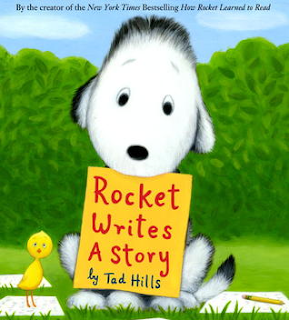 Rocket loves books and he wants to make his own, but he can't think of a story. Encouraged by the little yellow bird to look closely at the world around him for inspiration, Rocket sets out on a journey. Along the way he discovers small details that he has never noticed before, a timid baby owl who becomes his friend, and an idea for a story. I liked the way the story brought out some of the realities of the writing process, but I found the story itself a little slow paced and wondered whether it would hold a child’s interest. A little bit of mystery about a nest in a tree helped to carry the story forward and I could study how the illustrations and words worked together to make this effective. Overall, this book seemed best suited for educational purposes, rather than for entertainment. This would be a good book to support a discussion of the process of writing. I appreciated the way the story showed how much hard work goes into writing and how a story can continue to change as the writer thinks of new ideas or re-reads what is written. This story also showed how we can be inspired by nature, which fits with the Reggio Emilia philosophy of teaching. However, the story itself was a little quiet for me and could have benefited from a bit more action or conflict. This book would be suitable for grades K-2, but in a kindergarten class, I might break up the reading into a couple of sessions, since it’s long for a picture book. When I was teaching third grade I would have loved a book like this to help teach writing skills. Your "Learning from Picture Books" is a great idea, Andrea. I'll look forward to those posts. I also write PBs when I'm not working on MG novels. I've read this charming picture book and I have to agree it's a little slow and quiet and I've wondered if kids would like it. Would this have been published if it was his first book? Since he's the successful author/illustrator of those Duck and Goose books, maybe he gets a pass. What Inspires You to Write Better?